Thus begins the introduction to The Broken Road, the third and final part of Patrick Leigh Fermor’s account of his walk across Europe – from the Hook of Holland to Constantinople between 1933 and 1935, which was published today. These words, however, are not Leigh Fermor’s. He died in 2011 at the age of 96 having spent over twenty years trying to write this book. Ironically, he almost already had. 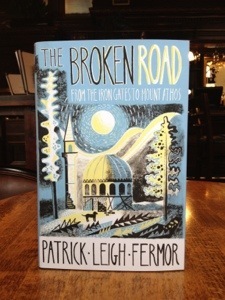 The Broken Road is based on a manuscript that Leigh Fermor wrote in the sixties. It has been edited by Artemis Cooper and Colin Thubron. The omens are good for this book. Thubron and Cooper are both distinguished writers in their own right. Cooper wrote the excellent biography of Leigh Fermor that appeared last year. As with Paddy Leigh Fermor so with Alexander. His masterpiece was his expedition across the world. What could he have achieved if the hearts of his men not given out? If Hephaestion had not died? If he had not drunk so much, received so many injuries, perhaps – just perhaps – if one or more of his officers had not poisoned him? We’ll never know. And we’ll never know what PLF’s Broken Road would have looked like, or even how it would have been titled; this one is Cooper’s and Thubron’s and is given in recognition of the fact that the account ends just before Leigh Fermor reaches Constantinople. We are left with informed guesses, our imagination and wise heads like Cooper and Thubron to guide us. As I sit in the pub with a celebratory beer – yes, I like PLF that much! – I can’t wait to walk the last stage of Leigh Fermor’s journey with him and with thanks to those who have made this experience possible. As I read I shall say a little thank you to those men whose effort has kept the memory of Alexander alive. Their texts are all political in one way or another but I’d rather have that than no text at all.